The tilt-in-space enables higher leg elevation for improved circulation. When the tilt is in operation there is no friction or shear as the seat to angle remains constant. The dual motors also allow the footrest and backrest to be operated independently of one another. The Braithwaite dual motor Lift Chair operates the backrest and footrest separately, using a dual motor design. The tilt-in-space enables higher leg elevation (ankles above hips) for improved circulation. When the tilt is in operation there is no friction or shear as the seat to angle remains constant. The backest sections have integrated zips so filling can be added / removed as required. The front castors lift of the floor when the chair raised to stop backwards movement. Also includes battery backup and batteries are included. 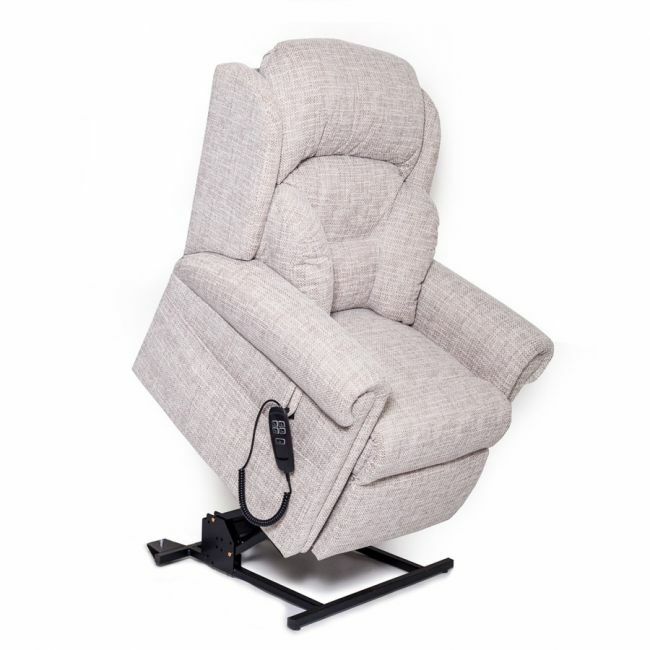 Width - 85cm / 33.5"
Depth - 103cm / 40.5"
Seat Height - 52cm - 20.5"
Seat Width - 49cm - 19.5"
Seat Depth - 51cm - 19"
Backrest Height - 75cm / 29.5"
Length Fully Reclined: 173 / 68"
Armrest Height - 19cm / 7.5"
Distance Needed From Wall to Recline - 51cm / 20"